The Rail, Tram and Bus Union (RTBU) covers all employees in the rail, tram and bus industry. The RTBU was created in 1993, but its history and roots go as far back as the 1860s. 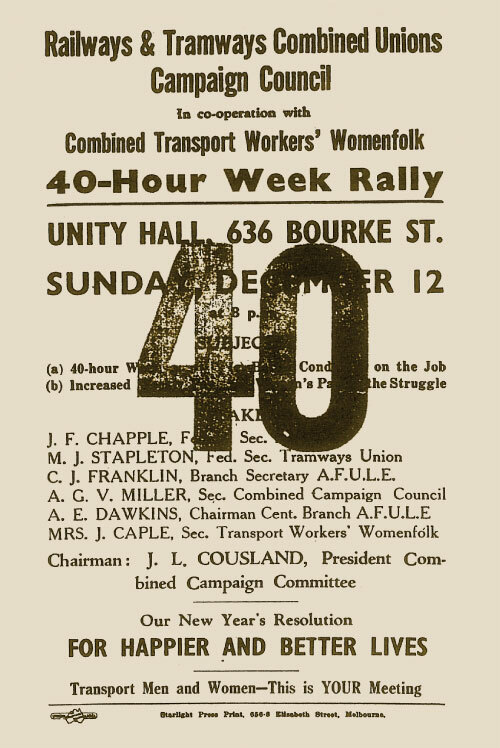 The modern RTBU was formed from the amalgamation of the Australian Federated Union of Locomotive Enginemen (AFULE), the Australian Railways Union (ARU), the Australian Tramways and Motor Omnibus Employees Association (ATMOEA), and the small National Union of Railway Workers (NURWA). It is now one of Australia’s major industry based unions. The amalgamation of the various unions and the creation of the RTBU was important because it gave rail, tram and bus members one unified strong voice in its dealings with Government and private operators, to defend and protect member’s rights. The amalgamated RTBU was the workers response to massive change in public transport, motivated by an anti-union and privatisation ideology driven by conservative Governments. Our union is affiliated with the Australian Council of Trade Unions (ACTU), the Victorian Trades Hall Council (VTHC), International Transport Workers Federation (ITF), the Australian Labor Party (ALP) and the Transport Unions Federation (TUF). The RTBU has six State Branch offices and a National Office in Sydney.The State Branches co-ordinate major campaigns with respect to State-based Collective Agreements, better industry training and improved safety for workers and the broader community. Members also benefit from other services including grievance handling, financial advice and legal support. The National Office coordinates national campaigns, negotiates national agreements and provides representation with the Federal Government, the International trade Union movement and the ACTU. The RTBU has provided support and representation for hundreds of thousands of members over its 150 year plus history and continues to protect the interests of the 35,000 members it currently services.